The interstate unfolds into western Oklahoma—where it’s flat, so flat. Just past Yukon and El Reno, there’s nothing but farms and blue sky on all sides of the highway. Long stretches of fields of bright yellow flowers also lined the highway, north and south—what crop was it? Canola. Canola is something farmers plant on the “off” years, between wheat crops, to cleanse the land of poison-resistant weeds that can crowd out the wheat. Long stretches of fields of bright yellow flowers also lined the highway, north and south—what crop was it? Canola. Canola is something farmers plant on the “off” years, between wheat crops, to cleanse the land of poison-resistant weeds that can crowd out the wheat. The yellow fields were really beautiful against the blue sky of an early April morning. Perfect complimentary colors. I’d never seen anything like it before, not in Oklahoma. The scene waited not far from where I live, but I don’t venture out in that direction very often. The drive up to Roman Nose State Park is uneventful except for those fields of yellow canola flowers. There are a few highway signs, telling you where to turn. There are a few small, empty-looking towns—Geary, Watonga. They’re the type of towns that confirm any theories about the decline of rural America—as people move away, to the cities, the towns get run-down and forgotten. At least that’s the view from the highway—old battered houses, beat-up cars, vacant buildings with faded signs. We finally made it. Within the hour, we’d picked out a campsite near the lake, and staked the tent into the ground. We made lunch, sitting at the picnic table in the sunlight. “Is there anything better than a sandwich?” I asked, after my first bite. How satisfying it all was, all of it. Roman Nose State Park was named after Henry Roman Nose, a chief that owned all 600 acres of the property. That’s all the signs told, with a line drawing of a Native American, in a feathered headdress with an exaggerated, angular nose. The park is small, a dot on the map, really. We found the place quiet, and mostly empty—the first campsite off the road had just a truck and tent already set up, and the second—the one we chose—was completely vacant. After lunch, we walked down the street to a putt-putt course and to the General Store, where brightly-colored paddle boats floated near the dock of the lake. I nodded, thanked her, paid, and left. We decided instead to play putt-putt, while the dogs laid out on the narrow greens, their leashes tied to a tree. It was a quirky course—painted metal statues of a castle and a cactus and a smiling Bugs Bunny, all with curved tunnels at their bases. At the end, we tallied up the scores. Jacob beat me by three strokes. We laughed, eavesdropping, looking over our shoulders from the picnic table to watch them work. We’d gotten instructions on where to hike from the lady at the main lodge of the park. She’d highlighted the trail on a map she gave us. “This leads up to Inspiration Point. It’s the highest point of the park, well, of the whole area.” I looked down at the map, noting the switch-back looking part near the top of the hill. So we set off. The terrain was arid—red clay earth, broad-billed cacti, fields of dry grass. The hike beside the lake was tree-covered and shaded, then it opened up into a clearing where the trail followed the dam on the north side of the lake. We’d been walking already for ages, but you could make out the RV campsite on the other side of the lake; it seemed so close, too close for how long we’d been walking. I looked down at the map again, trying to recognize the turns in the trail with what we were seeing. The map exaggerated it all, but I could match it up. The climb up to the top of the hill was more narrow and steep in some places. The dogs followed behind. I could hear Littleman panting and I looked back at him a few times. Even though I worried he was thirsty, he looked happy. Ranger followed behind Jacob. He was also panting, and not looking quite as happy, but he kept up. We finally made it to the top—an overlook with a vista of the whole park and the small, red canyons to the north. There was a podium with a drawing of the same canyons, except a wide river snaked back and forth between them. The scene didn’t look quite like that now—the river had long ago been dammed up to make the lake, and the clearing between the canyon was now thickly tree-covered and green. I sat down, resting, on the rocks, wanting to take the time to appreciate why we’d come: the view. 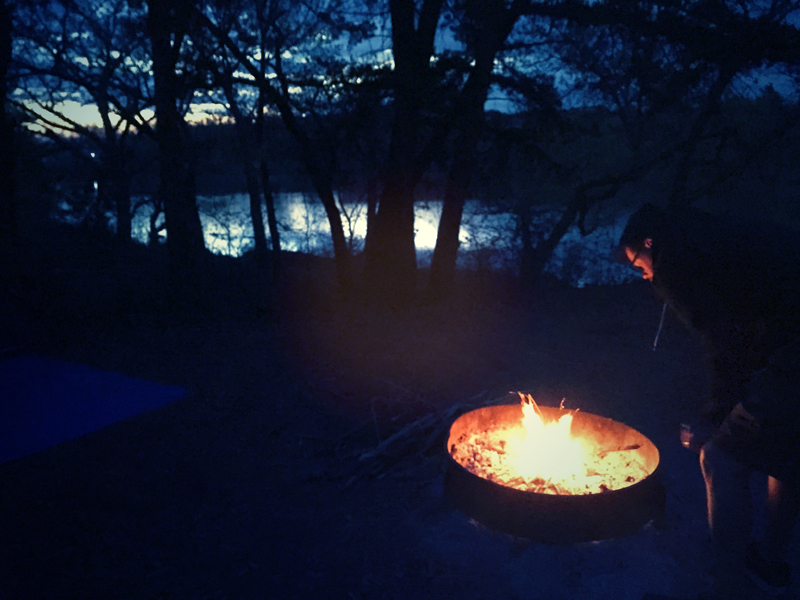 Camping isn’t quite camping without a campfire. When we paid the $12 fee for our campsite, I’d asked about getting a bundle of firewood. I’d read in the park FAQs you had the option to buy bundles—or just take what you could find from the woods. Jacob hesitated when Monty, the man behind the desk, reminded us of this.”It’ll save you $5,” he assured us. So Jacob told him we wouldn’t need the firewood after all. I didn’t disagree, even though I’d planned to just buy it, and save the hassle. Monty scribbled out where he’d written out “firewood” on our receipt and handed it back to us. After the hike, we were hungry—it was already after 6pm. And that’s when our firewood situation became more obvious. I scavenged the area, but only found a few armfuls of twigs, and a few more substantially-sized fallen branches. That’s when I started to get worried. “This isn’t going to be enough to last us all night,” I told Jacob finally. I knew I had a scolding, I-told-you-so tone. “I’ll go back to the lodge to see if we can buy some now,” he said, calm, as always. He left while I went back to scavenging around the campsite for what I could find—which wasn’t much. I was really, really worried. I couldn’t imagine sitting in the dark without a fire. It would have been a complete camping failure. While he was gone, I finally sat down, feeling helpless. At the campsite behind us, there was a man giving a Bible study. His voice carried across the lake. He read some verse out of 1 Corinthians. I faded in and out of paying attention, watching the road for Jacob. I saw his car pass in the opposite direction, down the street, and I knew that was a bad sign. I knew everything would be ok when he turned the car around to back in, an indication that he had something to unload. And he did. He’d found plenty of good firewood. The sight of that firewood stacked in the back of the car–what a beauty. It felt like a gift, like we’d caught a boatful of fish. We’d have plenty. “Down by the amphitheater,” he said. “There’s plenty more if we need to go back.” He nodded down the road, then shrugged like it was no big deal. We cooked our hotdogs over the fire, watched as the sun faded into dusk. More campers had arrived—a father and son took the spot across from us, and a family with two toddlers and a dog to our left. A carful of teenagers arrived just after sunset, staking their tent by the light of their headlights. I was glad the close quarters didn’t seem too bad, after all. We stayed up until nearly eleven, the last campfire glowing into the night. We finally settled into the tent, putting the dogs in their beds, zipping up our sleeping bags. The floor of the tent went downhill slightly, so your head sloped into the incline. It’s not a great night’s sleep—camping. But that’s definitely not the point. The sun was just coming up over the lake—and the sight of it was mysterious and ethereal. With the storm clouds in the distance, it wasn’t a bright sunrise—just a blue dawn, the morning light coming from behind the clouds, all blue. I snapped a few photos of the scene—the light reflecting off the lake, the shadows of the clouds and trees. It felt like my secret—the feeling that early morning usually gives you: hushed reverence. We woke, before dawn, to long rumbles of thunder. Their location seemed distant, but I couldn’t believe it. I’d checked the weather before we left to make sure–no rain. More rumbles of thunder. No one seemed too alarmed (except of course, Ranger). No one was stirring outside, or talking. It thundered and thundered. So we finally got up, while it was still dark. The sun was just coming up over the lake—and the sight of it was mysterious and ethereal. With the storm clouds in the distance, it wasn’t a bright sunrise—just a blue dawn, the morning light coming from behind the clouds, all blue. I snapped a few photos of the scene—the light reflecting off the lake, the shadows of the clouds and trees. It felt like my little secret—the feeling that early morning usually gives you: hushed reverence. We packed up everything in perfect time—right before the storm arrived and the downpour came. We even had time to build one last campfire, making a pot of coffee and roasting a few croissants over the fire. The thunder truly had been a warning of sorts, a “get ready.” Our phones wouldn’t work, so there was no radar to consult. It was just the sky and the sound of it, telling us. We were on the road before 8am, headed home. Once we had service, the radar revealed the storm, heading straight for the park, a giant glob of green and red and yellow. “It’s going to rain all day,” Jacob said. I thought about the people that remained—the father and son and the raspy-voiced couple with their fishing poles, the teenagers. The young family was also packing up as we left; they weren’t going to ride it out either. Would we have gone if we’d known there was a chance it would storm?